Join us at Creative Haven YXE for this very exciting new program for children. This educational and creative workshop is a great introduction to the world of art for children. We will run for two sessions over the February break based on age groups. Each session is 3 mornings or afternoons. Each day, children will learn about a different artist and then create a masterpiece in that artists style. We are very excited to announce that the first 3 artists we will we learning about are: Vincent Van Gogh, Frida Kahlo, Pablo Picasso. Our Instructor for the Workshop is Kim Laprairie and Kim has many years of experience in guiding children and adults through exploration of theory and techniques of Art. More about Kim: Kim is a self taught, expressive landscape painter with strong roots on the prairies. She has lived in the Canadian Maritimes and Florida but is happy to once again call Saskatoon home. She paints lively landscapes and bold still life's, choosing most often to use acrylic on canvas as her medium. Come and learn about this classic, misunderstood, artistic, genius. We will talk about Van Gogh’s artistic and personal journey. Let’s see what made him a pioneer of his craft! Kids will practice impressionist techniques and discuss basics in colour theory. 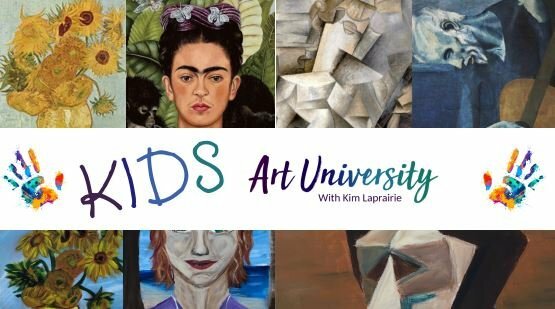 We will learn what makes Kahlo’s portraits unique and why she is an influential figure in art history. Kids will discuss symbolism and how to convey and interpret meanings in our art. Picasso is co-credited with the founding of the cubist movement and with using collage in fine art. We will discuss and learn about Picasso’s long and ever-changing journey in his creative adventures. By learning about Picasso’s search for his artistic style, children will explore how people can grow, change, and evolve in our own lives and creative journeys.